Very pleased with these shades. It's very helpful to be able to raise/lower them from the top or the bottom. I've got them in my bathroom and they work very well. I had these installed as part of an upstairs bath remodel. You can drop them to the bottom half of the window for privacy, while allowing full light to enter at the top of the window. These are an innovative and useful item, and I would buy them again. Ordered 2 of this size as well as 66" wide, all placed on our large 3-pane front window. About a month after having them up the 66" blind started separating from the railing at the top. I think the weight of the blind is too heavy for whatever adhesive was used. We used gorilla glue since it would've been too much a hassle to return, and that has held up. The only issue I have with the 33" ones is that they have stained easily with the dog trying to see through them. The price was good, but I do wish we would've saved up more money and bought a sturdier brand. 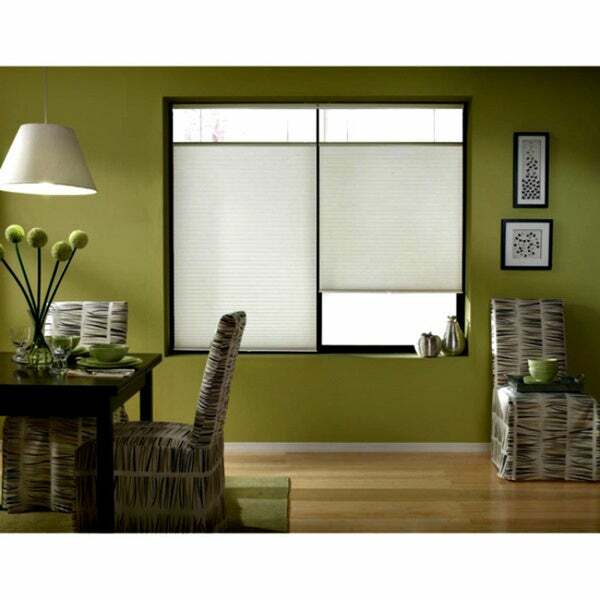 Easy to install, great looking modern blind with easy operation. A win given ease of custom size ordering. Easy to install and work as advertised. Great buy for $$. Wish the edges were more durable. Some edges of the one's i purchased cracked since its made of plastic and didn't survive the shipping but was repairable with glue. "Is the height of the mounting bracket at the top and the bottom of the shade including in the length of the shade measurement? If not how much could they be expected to add?" The top and bottom head rails are included in the height. The top head rail is 1 7/8" x 1 7/8. "Can this product be top mounted so I can put 2 blinds side by side?"